The IIT-Madras alumnus, Prem Watsa, who moved to Canada for an MBA programme and settled there, is not new to investing in India. The first annual report of Fairfax India Holding Corporation, listed on the Toronto Stock Exchange, published this month, could be easily mistaken for a report card on the Narendra Modi-led government. 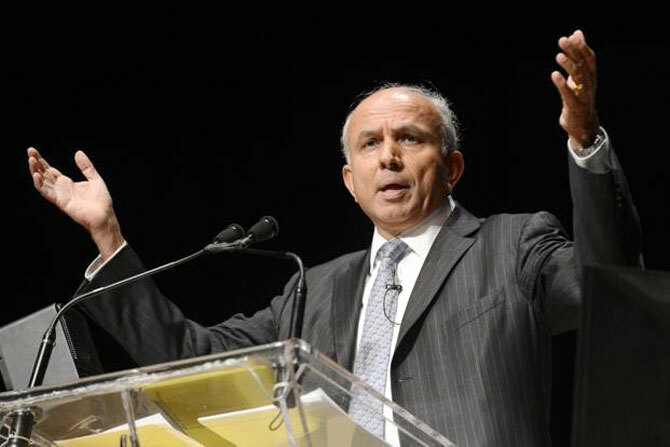 Prem Watsa, the chairman of the Canadian investment firm, counts as many as 30 achievements of the Indian prime minister. Among them are his efforts to crack down on crony capitalism, financial turnaround of state power distribution companies and his pet projects, including smart cities and Make in India. The chairman’s letter does not end with this eulogy alone—it moves on to predict the future of the Modi government as well. “We think Mr Modi can transform India, particularly if he gets re-elected for two more terms, as we think he will,” says Watsa in his letter to shareholders. “He has an excellent track record, is incorruptible and is business friendly. We expect Mr Modi to be the Lee Kuan Yew of India,” he adds. Though it is quite unusual to find all this in the chairman’s letter to shareholders, it is not quite unexpected. Watsa formed Fairfax India Holding Corporation following his meeting with Modi in November 2014. Modi was on a state visit to Canada then to garner foreign investment. Watsa responded to his India Calling appeal by raising $1.1 billion by listing this company on the Toronto Stock Exchange in January 2015. He promised to primarily invest this amount in India in a couple of years. With Fairfax India along with Fairfax Financial buying a 33 per cent stake in Bangalore International Airport for Rs 2,149 crore from GVK Power and Infrastructure this week, Watsa is quite on track to fulfilling his promise. Last year, he made three investments from this India-specific fund. This includes additional 26 per cent stake in India Infoline for Rs 1,621 crore and a 74 per cent stake in National Collateral Management Services for Rs 800 crore, besides a small investment of about Rs 160 crore in specialty chemical company, Adi Finechem. To be sure, the Hyderabad-born 66-year-old promoter of Fairfax Financial Holdings is not a regular Modi bhakt. He is known as the ‘Canadian Buffett’ because of his contrarian approach to investment. His track record is rather impressive: his flagship investment arm has seen its book value grow 20.4 per cent every year over the past 30 years. This is against a 16 per cent growth in book value of Warren Buffett’s Berkshire Hathaway in the last 28 years, for which data is available. The IIT-Madras alumnus, who moved to Canada for an MBA programme and settled there, is not new to investing in India. He first acquired a 26 per cent stake in general insurance company, ICICI Lombard, in 2001 through Hamblin Watsa Investment Counsel Fund. He also served as a director on the board of ICICI Bank from 2004 to 2011. He made his second investment after almost a decade in 2011 when he first bought a 9 per cent stake in brokerage firm IIFL in 2011. A year later in 2012, he acquired 77 per cent stake in Thomas Cook India. In 2013, he was also in the race to buy Blackberry, but he failed to raise money for the deal eventually. The meeting with Modi in 2014, however, turned things around for Watasa. He is now firing on all cylinders in India with flagship Fairfax Holding. Industry insiders attribute Watsa’s success to his ability to raise money through share capital instead of a fund that pools money from a limited number of partners. This saves him from regular redemption pressure and allows him to think long-term. No wonder, then, he can dream of two more terms for Modi.